Shasta daisies (Leucanthemum) and their chrysanthemum cousins have a long list of diseases, as the University of Massachusetts Extension Service admits before listing them all on a fact sheet; yet, when given full sun, good soil that is well-drained and the proper amount of water, they're basically trouble-free. 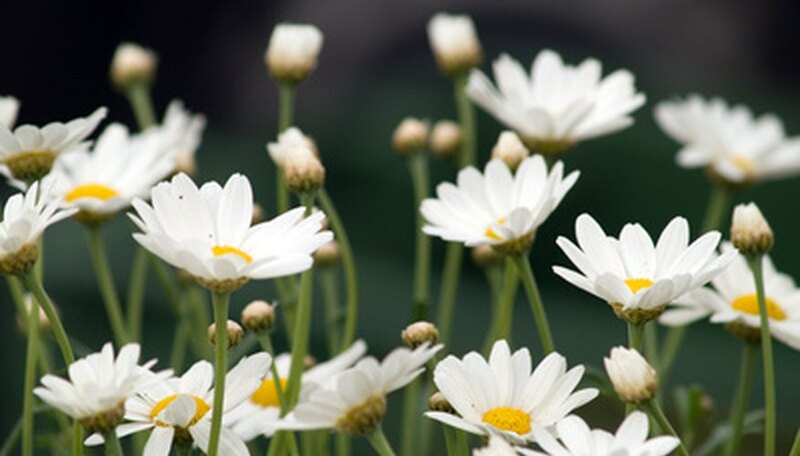 Humidity, too much rain, poor air circulation, heavy soil or a combination of these conditions can increase the odds of certain diseases having an impact on Shasta daisies. Alternaria and septoria are two common forms of fungal leaf spot affecting Shasta daisies. The University of Massachusetts Extension describes the symptoms of alternaria as spots that start yellow, turn brown and then black, eventually killing the leaf. The leaf spots usually begin at the bottom of the plant. Septoria leaf spot starts the same progression by turning the leaf edges brown, according to the University of Illinois Extension. Water splashing from diseased plants onto healthy plants spreads the infection. Remove and discard diseased leaves. If the disease is advanced, the University of Massachusetts Extension recommends using a fungicide with such active ingredients as chlorothalonil or mancozeb, applied according to label instructions. Powdery mildew will affect the leaves and stems of the Shasta daisy, according to the University of Massachusetts Extension. It appears as a splotchy whitish or gray film. Leaves may eventually die. Powdery mildew is unique in that it doesn't spread by splashing water. It is caused by high humidity and heat and is exacerbated by poor air circulation and not enough sun. The University of Massachusetts Extension recommends doing what you can to improve conditions. At the first sign of the problem, use a fungicide with such active ingredients as myclobutanil or sulfur. According to the University of Massachusetts Extension, gray mold or botrytis affects the buds, leaves and stems by turning them brown. Moist brown lesions may occur and a moldy substance often appears on parts of the plant. Remove affected parts and dispose of them in the trash. The infection spreads by splashing water and is quite contagious. Humid weather worsens the infection. The University of Massachusetts recommends a fungicide having such active ingredients such as chlorothoanil or mancozeb. Follow label instructions for application. According to the Missouri Botanic Garden, Shasta daisies may sometimes contract stem rot and verticillium wilt. The causes of stem rot can be fungi, bacteria or nematodes (microscopic organisms) in the soil. If the plant is exhibiting symptoms of stem rot, the problem is too far advanced and the plant should probably be removed. The disease stays in the soil, so don't plant in the same location. The Missouri Botanic Garden mentions that a fungicide drench is available to treat some stem rots. According to the University of Massachusetts Extension, verticillium wilt is caused by a fungus that lies dormant in the soil. Leaves yellow and wilt from the bottom of the plant upward. The plant may not recover. Why Do the Leaves on My Jalapeno Pepper Plants Turn Yellow & Curl?